Opening Feb. 25, visit oprfhs.org for tickets and show times. In a coordinated effort, four pairs of gloved hands pull with all their might until their entire teen bodies lay hip to hip, shoulder to shoulder, on the floor behind the thick velvet curtain. In front of them, two others, standing, use the same effort, pulling the black ropes with finesse, so what occurs on the other end is timed perfectly. On the other end of the wires: three actors lifted as high as the lights that illuminate the stage. With the same painstaking control, the flying operators lower the actors down, timing so they arrive on stage together. When it is over backstage, someone says, "Ow." Even with gloves on, there are rug burns on their palms from the ropes. 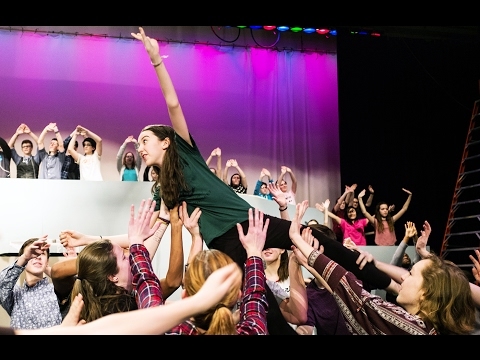 When Oak Park and River Forest High School puts on its spring musical, it's always a big production. But this year's show, "Mary Poppins," has an added challenge – characters who defy gravity. Heading up this feat is junior Brian Gallagher, master rigger, and also a flying operator. Gallagher explained the rigging for the show was installed by Vertigo, a professional company that has done shows like this numerous times, ensuring the safety of the equipment. Besides installation, Vertigo conducted a three-day training to ready the crew to use the equipment. "We started out lifting someone up then putting her down. Then we worked up to flying moves," Gallagher said. "The actors were a little unsure at first, but after doing it, they trusted us and knew they were safe." Lizzie Maguire, who plays Mary Poppins and is a senior, is one of five actors in the show who, at some point, is attached to the fly rigging. Maguire finds her flying scenes to be fun, but also has to remember to stay in character. "I'm getting pulled every which way, but Mary's mannerisms are 'practically perfect' so I need to keep my feet together. I can't just lay there as I get pulled up." Others in the show have done their part to accommodate the flying sequences. Senior Greta Fleischer, student technical director, is also head captain of the run crew, the team of 10 that move the sometimes huge set pieces during the show. She said it's crucial that everything has to be in its exact spot, and one particular piece, used when a character "walks" up it, needs to be sturdy. All of this ensures the actors' safety. Lighting designer Katherine Woodworth, a senior, said having flying on stage requires changes to typical designs, including removing lights that are in the way as actors go up. To illuminate them, spots will be used, but also an intelligent mover light is being rented to track the actors. "We don't typically light high up, so we are doing that," Woodworth said, "But, we want to make it look magical, too." Nadirah Muhammad, co-master sound engineer, as well as a flying operator, said audio is another area taking flying scenes into account. Hanging microphones in places where they won't interfere with wires in the fly sequences and putting mics on the actors while wearing harnesses had to be figured out. When it comes to running through the show, stage manager Ben Brotman, a senior, calls the shots, coordinating the crucial timing between the actors lines and what the crew does back stage. Gallagher works closely with him to ensure his flying operators are all in sync. All of the crew described this show as the largest scale production they've ever worked on. The cast of 110 and crew of 40 spend every weekday afternoon from 3 p.m. to 6:30 p.m. at rehearsal, crew also comes in on Saturdays, and many beyond that. One flying rehearsal went well past 8 p.m. The dedication of these students radiates from them. Brotman said he's always on top of his game as stage manager, but gets less sleep and hardly does homework. Muhammad, a senior, started doing 30 pushups every day to build strength for her role as flying operator. And Gallagher spoke of constantly moving during the production. "I'm doing something every second," Gallagher said. "But theatre is addicting. I wouldn't know what to do if I didn't come here."